The Scales Collection dropped a new episode of their podcast, and this one features a rowdy interview with the infallibly wonderful Tressley Cahill. Tressley is a well-known mid-school yoyo player from the East Coast, as well as an accomplished graphic and UX designer, drummer, and 2014 winner of the “Best Smile In Skinny Jeans” award from someone who was looking over my shoulder at a photo of him on Facebook one time. He’s responsible for tons of artwork in the yoyo industry, including logos for two projects that are near and dear to me: 365yoyotricks.com and PurpleYoYo.org. Dig in and enjoy! Scales Podcast is sponsored by YoYoExpert. The Scales Collective is at it again with another podcast that brings an influential force in the yoyo industry to the front. Seth Peterson talks with Keiran Cooper and Patrick Canny about Save Deth, the first lifestyle brand in the yoyo industry and a huge creative force in the “mid school” period just after the Hyper YoYo boom died out. Seth Peterson is one of the most influential yo-yo players of all time, but unlike most, it’s for more than just his tricks. Seth led a very inspiring yo-yo movement called Save Deth, in which he had travelled with Dave Poyzer all over the United States and filmed amazing yo-yo content, whether it be at contests or just in a casual scene. On top of this, Seth’s attention to design and detail in all aspects such as clothing and content is something that lots of people worldwide learned and stemmed off of. To call him an innovator is an understatement; he is a pioneer. Ryosuke Kawamura’s latest video brings us a full profile (with interview!) of Filipino player Hiro Koba, the owner of Kitty String. Hiro is a great dude, a solid yoyo player, and he makes the best string in the industry. Enjoy! Q1. When did you start playing yo-yo? T: In August of 1997. S: I don’t remember well, but probably around the spring of 1997. Q2. Why did you start playing yo-yo? S: For some reason or another, I picked up a yo-yo from the display on the right-hand side near the entrance of a toy store. That was the beginning. Q3. Who are some of the yo-yo players you respect/admire/look up to? T: Yu Kawada – He was the reason the AP Division was established, and he is the only one I will go to for an opinion about my yo-yo performance [and vice versa]. Hironori Mii – He was the person who got me to participate in the World Contest [for the first time] and I wouldn’t be who I am now without him. Hiroyuki Suzuki – Even while the younger generation keeps moving up, he’s still fighting at the top, and the cleanness of his tricks is on another level. Takuma Yamamoto & Tsubasa Onishi – I watch their freestyles and think they’re really incredible. Their attitude is like an athlete’s. S: TOMMY – There is no one who surpasses his ability to express with a yo-yo. 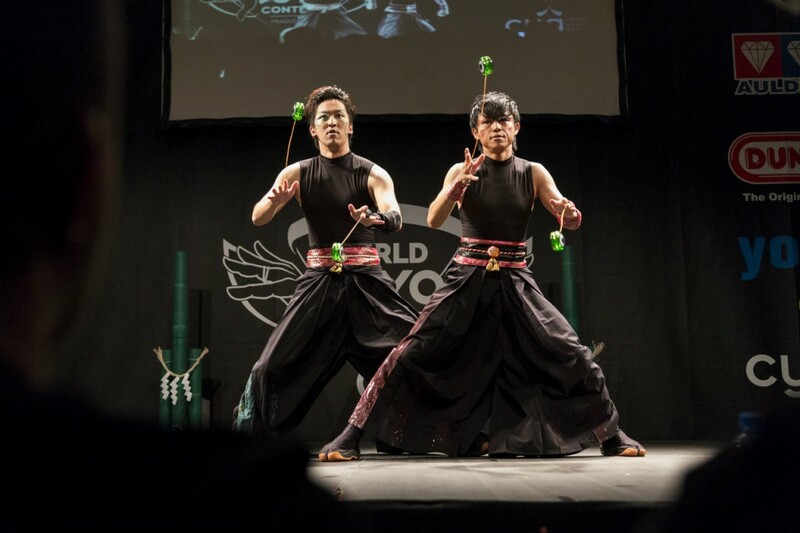 Hiroyuki Suzuki, Kengo Kido, Atsushi Yamada – As well as being yo-yo players, they all have started their own brands and stand out as leaders [in the yo-yo world]. Q4. What made you two come together to form SPINATION? T: In 2012 I was planning a performance project and I invited Yu and we performed together. After that [we realized] we are both World Champions and are both mainstays of the AP Division! If we join forces we can’t lose!! Then, not only just at Worlds, we started doing real theater and other performances [together]. S: I hadn’t entered the World Contest since 2006, but I began to have some strong feelings about the AP Division itself. The feeling of wanting to enter the AP Division began to overflow [in me]. However, I also felt like there was a limit to what I could accomplish as a solo act. In my thinking, the power of expression and the number of things one can do can increase with the number of people participating. I came to the conclusion that for yo-yo and the AP Division to get on the same level as other entertainment fields, it was necessary to form a team of high level players and make an attempt at something bigger. It was there that [I decided] to join up with TOMMY, someone who had been away from the yo-yo world for a while and was working as a professional in the entertainment world, but who had the same high level of thinking [about AP as I did]. SPINATION was formed with the goal of broadening the possibilities of yo-yo and moving closer to first-class entertainment. Q5. 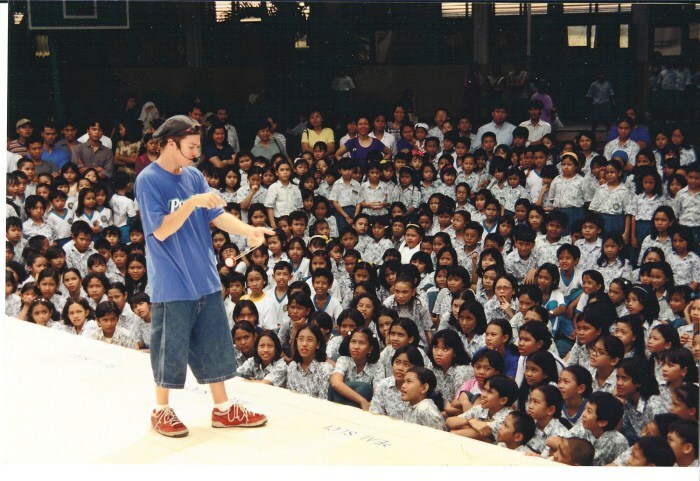 Usually, what kind of performance activity do you do as SPINATION? T: For the most part, our main focus is on domestic street performance festivals. We also do performances at other types of events. From now on we are also proactively working toward developing theater stage shows. Q6. I would imagine that there might be some difficulties with practicing together. Can you tell us about some of your experiences? S: Creating a performance that both of us can be satisfied with is difficult. Together, we have a strong mutual understanding so things often go smoothly, however we don’t always agree on things like choreography, tricks used, or the direction [of an idea]. Thus, doing something new is a difficult process, but we do our best to have confidence in performing each [show] we have produced. Q7. Do you have any good stories from last year, before you became world champions, that you want to share with us? The biggest episode of all was Yu’s sudden health collapse the day before our AP Final performance. We still don’t know the cause, but he experienced more than 24 hours of horrible gastrointestinal issues and was completely unable to eat or drink. He was in no condition to be performing. The night before we were seriously considering withdrawing from the competition. Yu falling down at the end of our freestyle video is real evidence that he had reached his limit in more ways than one. S: That’s right. I fell totally ill right before our performance. It was the first time in my life that even just standing was painful. Your body is an investment, so it’s really important to take care of yourself, especially when you are in a foreign country. Everyone, please take care! With water and raw foods especially. Q8. How did you feel when you became world champions? T: I was so happy we repeated our championship! Q9. Is there anything that changed for you after becoming world champions? S: Nothing has really changed, but I would like to make movement toward holding the AP Division in Japan [Translator’s note: we think he means at Japan Nationals]. Q10. How do you feel going into this year’s World Yo-Yo Contest? T: We will definitely win for the third consecutive time! We hope that we will be able to pull off a performance that will make you think “It’s just like SPINATION [to do something like this]!” Please cheer for us!! Q11. What is yo-yo to you? It is also like a part of my body, as well as the thing that gave me infinite possibilities of expressing myself. S: It is one aspect of my own possibilities. When I was in 1st Grade in Elementary School! Because of the 2003 Hyper Yo-Yo [promotion]! There are players I admire but I’ll leave it without saying who. Q4. What made you choose 5A as your main style? I was shocked to realize “There’s such a division in yo-yoing!” and it seemed interesting! Q5. Last year you were also the runner-up in the WYYC 1A Division. Other than 5A and 1A, do you plan to enter any other divisions in the future? I haven’t really decided, but if I start to feel like I want to enter [a division] I will! Q6. How do you usually practice (where, who with, etc.)? Usually I don’t play yo-yo in a “practicing” sense. I just kind of do what I want to do at that moment. Q7. How does that change when you are preparing for different types of contests? Before contests I rent a room in the community center and practice in a wide-open space. Q8. Do you have any good stories from before you became a world champion that you want to share with us? Do you have any good stories from before you became a world champion that you want to share with us? Q9. How did you feel when you became a world champion? Q10. Is there anything that changed for you after becoming a world champion? I received the Global Award from my home prefecture, Saitama, and became a Saitama Goodwill Ambassador! Q11. How do you feel going into this year’s World Yo-Yo Contest? This year I plan to make a great effort in not only 5A, but also 1A. I want to do freestyles I can personally feel satisfied with and I aim to win, so please cheer for me! Q12. What is yo-yo to you? [Yo-Yo is] Something that continues to broaden my world! Many thanks to Takeshi Matsuura! We wish him the best of luck at the 2015 World YoYo Contest. In 1997 (if I remember correctly, in the fall). At the time yo-yo was going through a popularity boom [in Japan]. My friend brought a Hyper Brain to our Elementary School’s festival and he showed me some basic tricks like Rock the Baby and Walk the Dog. It was partially because of the boom, but I thought, “I want to try it!” and made up my mind. That same day I went with several friends to a toy store in my neighborhood and we bought red Imperials. I remember that it took about a week to be able to do a Long Sleeper for five seconds. At the World Contest from 2001-2014, for at least 10 years he has advanced to the Final round, and has won the hotly contested 1A Division four times. More than just “winning,” he has “continued to win;” more than “chasing [after other players],” he has “been chased.” Due to those things it can be assumed that he has been faced with enormous pressure, furthermore in 1A, and even then he is still battling it out at the top. [I respect how] he has seriously explored the depths of off string and how he carefully cultivates his competition freestyles. Not only in competition, but his show performances are also extremely polished, and he does it all without attempting to get away with using his show as an excuse to go easy. He has both strong technical and performance skills, and does a performance that is suitable of the title “World Champion” in various places [around the world]. In the Division of 2A, which particularly takes a long time to acquire technical skills, he has an outlook of always trying to do new things, and focuses on entertainment to use his performance to delight his audience. He loses neither of those qualities in competition and continues to display them at a very high level. Q4. What made you choose 4A as your main style? I started tackling 4A as a competitor for the first time just after I started university, but at the same time I was also juggling and playing diabolo. Both of those have many shared skills with 4A, so when I think about it now I think [4A] was very approachable [for me]. One more reason was that I often practiced with Eiji Okuyama, who was already active at the forefront of the [4A competition] scene. He taught me tricks, we created tricks together, and so I think my time practicing 4A naturally increased. Q5. How do you usually practice (where, who with, etc.)? As a working adult, there are limits to the time and location [I can practice], so I try to keep in mind the most efficient way to practice in order to raise my level even just a little bit. On weekdays when I’m very limited as to where and when I can practice, I mostly practice tricks by repetition. On the other hand, on the weekend I spend most of my time practicing my freestyle performance and attempting new tricks. Also, to a certain point I try to decide that day’s practice schedule, whether it is for an hour, two, or more. I find that if I decide a goal or theme for each practice session (ex. trick repetition -or- freestyle run-through -or- developing new tricks -or- working on my weaker elements, etc.) it’s easier to tackle and more efficient overall. As for the people I practice with, Shinya Kido and Kazuki Okada live nearby, and Hiroyasu Ishihara and Yusuke Otsuka. We often get together and practice. Q6. How does that change when you are preparing for different types of contests? I primarily focus most of my practice on doing freestyle run-throughs. In addition, when I’m practicing with other people, in order to get used to doing my performance with other people watching, I try my best to get through the whole routine without stopping. – Practice in the same outfit I plan to wear in competition. – No matter how many mistakes I make, I follow the structure of the routine until the end. With 4A, the string is often close to my body. I have a lot of tricks where the string touches and moves around my body so I need to make sure I get used to doing those tricks in costume, otherwise the string may catch my clothing in an unexpected way and could lead to an extremely unfortunate and wasteful mistake. Also, even if I have a lot of mistakes when I practice [my freestyle], I don’t stop the music. I think it is very important that I run through the entire routine until the end. Of course, at the contest it’s possible that I may not have a no-miss routine, so if I don’t practice like that, I may not be able to recover from a mistake and from there my freestyle might start to fall apart. Therefore, I think it’s necessary to make a habit of recovering from mistakes. A yo-yo freestyle is a very limited time of only 3 minutes. You need to be able to decide in a split-second whether or not to change your yo-yo, so I try to focus my practice on recovering from mistakes and enhancing my own ability to make quick decisions to cope with my situation. Q7. Do you have any good stories from before you became a world champion that you want to share with us? At the 2013 World Yo-Yo Contest, my freestyle had more mistakes than any other freestyle in my competitive history, and that was a huge shock for me. My theme after that was “comeback” and I practiced [thinking about that] for a full year. After 2013 WYYC ended, two days after I returned to Japan, I went straight to the local gymnasium/community center and started practicing for the next year’s contest. [I thought about] how to tackle yo-yo as a competitive sport, and what kind of practice would be necessary for that. I had to reconsider my own weak points. I put all of that thought into starting practicing again. I also got a lot of motivation from watching different communities other than yo-yo. When I looked at the top contenders of worlds such as Diabolo, Juggling and Dance, I saw that they are thoroughly exploring their crafts, and thought that this was no time for me to let myself fall into a slump. Q8. How did you feel when you became a world champion? For the one entire year I spent [practicing and preparing], the happiness of reaching my absolute best possible result was huge. As far as my freestyle, it was quite possibly my first ever perfect, no-miss, 3-minute routine in my entire life. It was a very emotional moment for me. I felt that the hundreds of hours I spent practicing and trying to get better were not in vain. Q9. Is there anything that changed for you after becoming a world champion? Actually there weren’t any sudden changes for me in particular. If anything, at the World Contest I set my next goals, and in practicing I increased my repertoire of new tricks. Looking back at last year’s World Contest, I felt that the level of competition was the highest in recent years and the level of perfection in each player’s routine suddenly jumped. This time I was able to attain the title of “4A Division World Champion” for the third time. However, there are still tricks I cannot do. I still make mistakes at competitions. There are still tricks that I need to improve my execution rate with. And above all, there are so many players that are better than I am. I am far from being “The best player in the world,” or “The perfect player.” Of course I want to get better and improve my way of practicing, and continue my enthusiasm that I have built up since the 2013 World Contest. Of course, since the World Contest is taking place in my own country, and up until now no one in the history of the 4A Division has successfully defended their championship, if I am able to win that would be amazing. However, in order to do that there is so much I need to do to prepare, and I have new tricks I want to perform so I need to improve their level of perfection. Of course, I can’t forget my original intent to work toward my goal of doing my 100% best on the contest stage. Since this is also the very first time the World Contest will be held in Asia, many veteran players from other Asian countries who previously found it difficult to attend due to location reasons will compete, so I am very much looking forward to the competition itself. Many thanks to Rei Iwakura! We wish him the best of luck at the 2015 World YoYo Contest. How would you define “technical yo-yoing”? The 2014 US National YoYo Contest was the high-point of this years US contest season, with a 1A Division that was absolutely stacked with top notch talent and had some of the best 1A freestyles we’ve seen all year! YoYoNews correspondent Matt McDade tracked down most of our new US National Champions for a Q&A. Did you expect to win? Zach Gormley (1A): I certainly felt that it was possible to take first, however, knew the competition would be fierce. The day of it all just comes down to who hits their freestyle the cleanest. While many other competitors this year made mistakes, it appears that I made the fewest. Joseph Harris (2A): Yes, without a doubt, I expected to take 1st place. Unless I had a major screw-up in my freestyle, I had little doubt about defending my title. Rumor was, Party Rick (aka Pat Mitchell) was not competing, so I had nothing to worry about…he makes me worry. Like. A LOT. P-Mitch is so gee-whiz good! Alex Hattori (3A): I always go to a competition to have fun and to do my best. I never bring any expectations. There are many great yoyoers, and anything can happen. Zac Rubino (4A): No, there are so many good players that could have won. Going into a contest, I don’t think in my head, “I am going to win this contest.” I just have the mindset that I want to hit my routine and put on a good show for the audience. Tyler Severance (5A): We kissed, I fell under your spell. A love no one could deny. What was your practice schedule like? Zach Gormley: Typically, I try to get in around an hour to two of practice each day, starting a month before the contest. This doesn’t need to be all just freestyle-practice, though. Much of my time is spent perfecting my tricks or finding ways to hit them more consistently for when I’m on stage. Joseph Harris: Non-existent. I selected a freestyle song a week before the competition. I did a true “freestyle” on stage, meaning what the audience live at Chico, and watching online, saw was the first time I did a full run of my freestyle performance. Alex Hattori: I didn’t really have a set practice schedule because I’ve been extremely busy with my rigorous high school curriculum, which includes marching band and robotics. Zac Rubino: At home, I practiced 2-3 hours a day, and for those hours, I only practiced my freestyle. The way I went about it was to practice 30 min-1 hour at a time, a few times though out the day. Tyler Severance: Don’t you ever say I just walked away, I will always want you. What were some goals that you hoped to accomplish with your freestyle? Zach Gormley: I had two goals for this freestyle. I wanted to improve my performance, as well as have a really dominant tech score. While I achieved the latter, my performance wasn’t where I wanted it to be. I think the mistakes I spent time correcting took up time I could have been looking at the crowd, yoyoing to the music, etc. Joesph Harris: Have fun, and go clean. I would have ended my routine early if I felt like I did not have fun or go clean. 2 minutes in, I felt comfortable that I had accomplished both goals. Alex Hattori: I really just hoped to show my best tricks and put on my best performance. Zac Rubino: For this freestyle, my goal was to win a National or World title. Tyler Severance: I came in like a wrecking ball. I never hit so hard in love. In your opinion, what separated your freestyle from others that were presented on stage? Zach Gormley: Lately, many yoyoers have caught on to trends that I’ve set in the past, so it can be hard to adjust my style or stay unique. Sometimes, I’m not too sure about what it is that sets me apart, but whatever it is seems to be working. I always try to do something different and bring new ideas to the table! Joseph Harris: Swag. And the clothing line helped. It was hot that day, so the tank top my cousin gave me while we were celebrating his marriage in Vegas freed up some arm space. So, I could move around with ease and not feel so sluggish on stage. If you watched the others, you could tell that my wraps separated my freestyle from everyone else. Alex Hattori: I think all of us 3A players are unique in our own way. Whether it’s bringing through some mind-boggling double Double or Nothing combo or by incorporating bangers, I think we all stand out from each other. Zac Rubino: I think what sets me apart from other competitors is my tricks. I try to make tricks that are hard, flashy, and score high. My favorite type of trick is a “banger”. I love snags, regens, grinds, and just about anything that looks cool. I know my performance evaluation scores are my weakness, so I try to make up for that with big, risky tricks. Tyler Severance: I never meant to start a war. I just wanted you to let me in. And instead of using force I guess I should’ve let you win. What yoyo did you use in your freestyle? Zach Gormley: I chose to use the Arctic Circle 2 in the Northern Lights colorway. Gotta represent CLYW! Best of the best. Joseph Harris: My signature series yoyo, the YoYoJam Unleashed, which has been used to win back-to-back Nationals titles. Alex Hattori: Duncan Barracudas, one red and one blue, with Dif-e-Yo Konkave bearings. Zac Rubino: The yoyo that I used in my freestyle was the Duncan Skyhawk. Aside from yourself, who else would you have liked to see win? Zach Gormley: Anthony Rojas has consistently placed top 3, and I would have loved to see him take the Nationals title. Gentry’s freestyle was top notch as always, and he definitely could have taken the title as well. It was also cool seeing Andrew Maider and Michael Kurti really step their game up. Joseph Harris: Of the people not competing this year, I would have liked Ian Lawson, Patrick Mitchell, and Grant Johnson. For those that did compete, I would have loved it if Josh Yee won. Alex Hattori: I would have liked to see the person who brought their best game take first. To tell you the truth, I really enjoy watching all 3A players. Zac Rubino: The other person that I would have liked to see take first place is Ian Johnson. Ian is a good friend, and an amazing yoyo player. 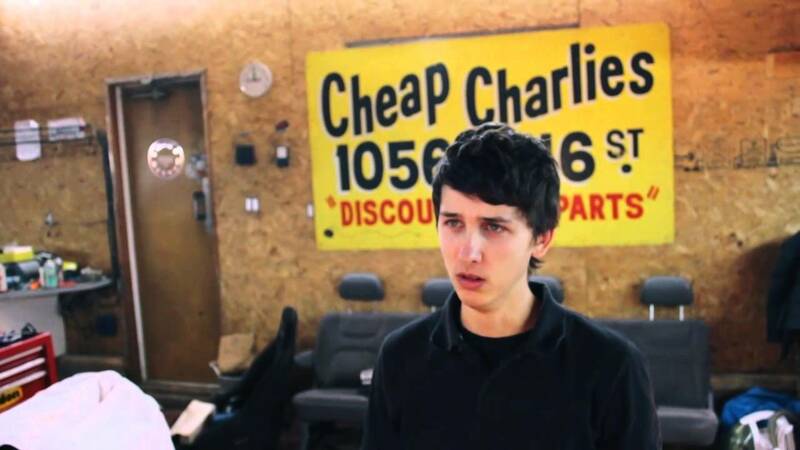 Tyler Severance: All I wanted was to break your walls. All you ever did was wreck me. What title do you plan on snagging next? Zach Gormley: 44Clash and Las Vegas Open are right around the corner, and I’d love to win one of those! Potentially, even both would be cool! Next year, I have my eyes set on Worlds in Tokyo, but I’ll cross that bridge when it comes. Joseph Harris: Chronologically, the next title would be the Las Vegas Open in Vegas which seeds the winners into semi-finals for Tokyo Worlds 2015. The big competition goal for me is to be World Champion before I retire from competing in two-handed. Alex Hattori: I don’t usually plan my life according to upcoming competitions. Instead, I work on improving my technique or creating new tricks after I’m done with Nationals. Then, as time rolls along, I see if I’m able to attend any more competitions based on my school academic schedule. Zac Rubino: The next contest I am looking to win is the 2015 World Yoyo Contest. When I started competing, there were 4 contests that I really wanted to win, which were Cal States, BAC, Nationals, and Worlds. This year, I won all of those contests except for Worlds. That is the last contest on my list, and the one I want to win the most. Tyler Severance: Yeah, I just closed my eyes and swung. Left me crashing in a blazing fall. What other non-contest related yoyo endeavors do you have planned for the near future? Zach Gormley: Outside of competitions, I’d love to work on some new videos. Charles and I have been tossing around the idea of potentially getting me up to Canada to work on some Cabin Tutorials. While it is likely, nothing is set in stone yet. 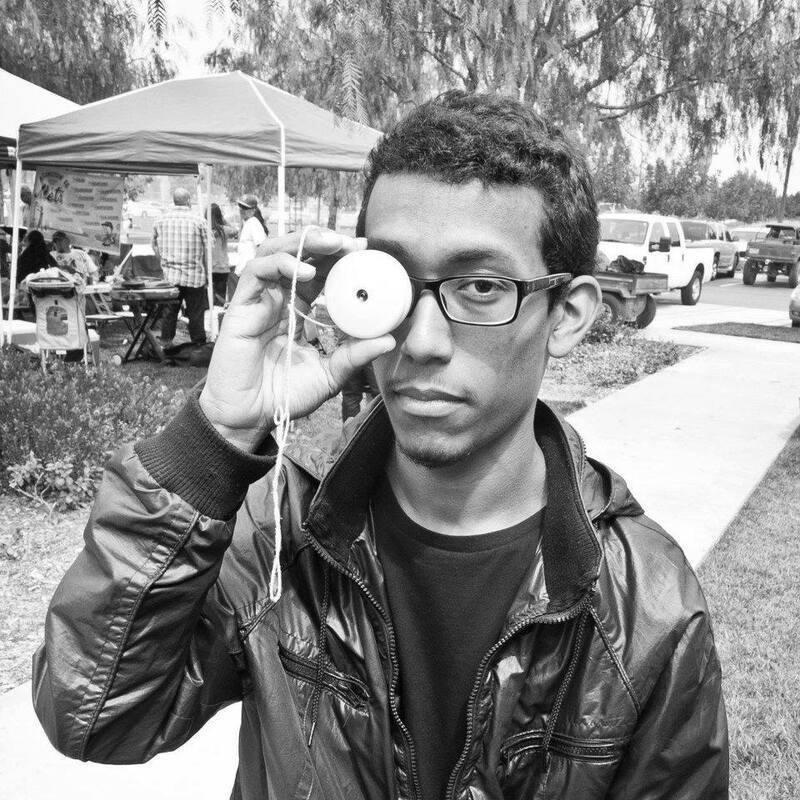 Joseph Harris: The main non-contest related endeavor for me is to get yoyos mainstream! In my eyes, it starts with grassroots efforts, such as the two new yoyo clubs I am helping run here in the San Francisco Bay Area. New yoyoers, like hundreds to thousands of them, is the first step to making yoyos and the yoyo community more popular. There will always be the next Gentry Stein, Zach Gormley, Anthony Rojas, Ahmad Karisma, Harrison Lee, Tessa Piccillo, Takeshi Matsuura’s of the yoyo world. My goal, as it has been since I was booted off America’s Got Talent Season 4, is to get the next generation of yoyoers to experience more positive exposure OUTSIDE of the yoyo community than the current yoyoers! Don’t YOU want yoyos to be mainstream??? 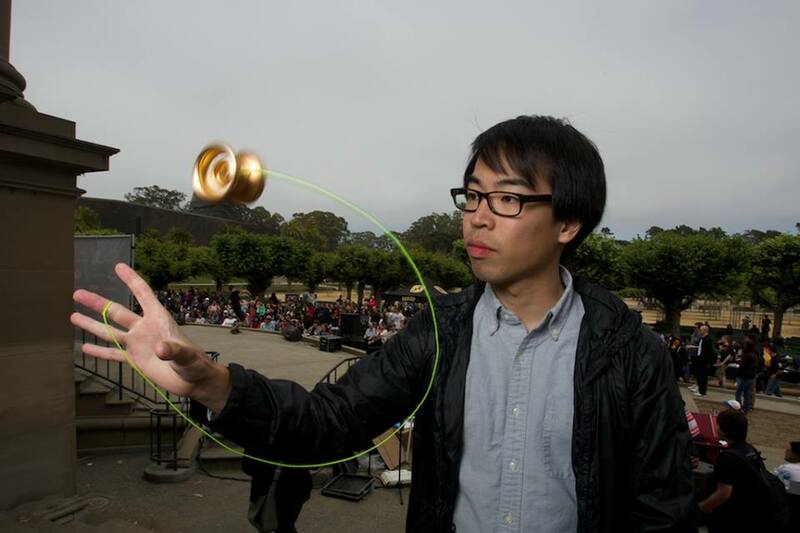 Alex Hattori: Well, I’m always actively volunteering in my community with yoyoing, whether it’s teaching, or performing for charitable causes. I perform at schools, fundraisers, libraries, convalescent homes, and all sorts of charity events. Zac Rubino: Besides contests, I have been filming a lot of videos with the Duncan crew. Be on the look out for those videos coming soon! Other than that, I don’t know what the up-coming year has in store for me. Tyler Severance: All you ever did was wreck me. Yeah, you, you wreck me. Yeah, you, you wreck me. Charles Haycock is an extremely creative, skilled, and unique yoyo player who is continuously creating amazing tricks, tutorials, videos, and more. The Team Manager for CLYW, Charles in an integral personality within the company and does a lot of great work in both promoting the company online and working with the company behind-the-scenes. To the yoyo community, Charles embodies creativity, and is a favorite amongst countless players for his unique, well-developed tricks. Charles was requested for an interview more than once, and I was beyond excited to talk with him about tricks, videos, CLYW, and more! Charles, first and foremost, how did you start yoyoing? My dad first bought me a wooden yoyo when I was about 8 or 9 years old (it might have been a Tom Kuhn yoyo actually, now knowing what they look like). He taught me Gravity Pull, Sleeper and Forward Pass, but it wasn’t long before I lost it. I ended up kind of forgetting about it for a long time; however, I still seem to remember how it intrigued me. Years later, when I was about 13, I snatched another wooden yoyo from a tourist shop while traveling in Oregon. During that trip, I also obtained a back injury which, for me, meant no gymnastics. So, I had a lot of time on my hands. My neighbor knew and taught me Eiffel Tower and Rock the Baby. Thanks to the internet, I then found the Yomega website where I learned some more basics, and was introduced to yoyos that looked more capable. My little sister knew of my interest, and for Christmas she bought me the most expensive yoyo she could find: the Metallic Missile. After that, I learned Trapeze and Double or Nothing, and soon found yoyonation.com and Andre Boulay’s tutorials on Expert Village. That was when the infinite portal was opened, and I’ve never been bored since. How long did it take you to get to the “Master” level on Andre’s tutorials? Oh, I really can’t remember, maybe a year after the portal opened? That could be inaccurate, but I remember skipping Ladder Escape and Superman because they were too hard for me. I ended up learning Superman years later from a friend, it’s a great trick. What were some of your favorite tricks that you actually did learn back then? It was so long ago, that time frame is a blur to me in some regards. But, I remember that some of the tricks/concepts that stuck with me early on were Kwyjibo, Magic Drops, Boing-E-Boing variations, and Whips/Hooks, of course. Then, a bit later from other places, I learned and liked Yuuki Slack Chops, Hashbrowns (Jake Bullock), Rancid Milk, and other Yuuki, Spencer Berry and Jake Bullock elements that I picked up from videos. There were many other inspirational players to me, but it was mostly those guys. Was that the period where you learned some of Spencer’s old tricks that you later made Cabin Tutorials for, like Enigma and Havoc? Yeah, Enigma came fairly early on, Sterling [Quinn] taught me that one, and Havoc some time after. I also learned elements from Breath and the Superman-ish trick in the “Spencer Berry’s Apartment” BAC 2008 video. I watched that video a ton. “Spencer Berry’s Apartment” is such a good video, that’s like the equivalent of having most of the CLYW team in the same video nowadays. Haha, well thanks man. But yeah, the camaraderie felt in that video is so appealing, and the tricks happen to be amazing as well. When did you first start getting into making up your own stuff? I started making up my own stuff very early on. That was, and is, where most of the fun is for me. I look at the yoyo and the string as me on a playground. So, I just play, letting my curiosity roam free to discover new things (‘new’ for me at least). Of course, it is easier to explore after you have learned some basics elements to work off of. But yoyoing can also just be pleasurable in itself, the feeling of doing a trick or how it looks. That’s why I have always enjoyed learning other people’s tricks, and it definitely affects my style. It’s like Ernest Hemingway, he used to write out entire Charles Dickens novels just so that he could know what it feels like to write a great book. Not to say that this is the only way to go about it; playing yoyo means something different to everyone, and even within the creative realm the process can vary greatly. Jensen, for example, never learns other people’s tricks. He is a real off-grid-type-hermit in that creative sense. Although, starting out, even he had to learn from others to implement that playground structure. Do you remember any of the early things you came up with? I can’t really remember that far back, but I think you can track it pretty well with my early videos. I started making videos fairly soon after I started, within the second year I think. Did you start competing early on? How did you get hooked up with CLYW? Well, I went to my very first contest in Seattle (PNWR) after about two years of yoyoing, and that happened to be where Chris asked me to join the team. I had put out a couple of videos at that point, and Jensen was messaging me before the contest to say that they were interested. So, I was very comfortable to not accept the other sponsorship offers I got. For those that don’t know, can you explain what you do at CLYW aside from just being sponsored by them? I work with the team to make videos, make sure they are getting gear, answer questions, support projects, make travel plans, etc. Then, I also contribute on CLYW’s social media. Speaking of videos, what’s your personal favorite that you’ve made or appeared in? My personal favorite that I’ve made is Ill Vibes. I think the idea was neat and it was fun to collaborate with Jensen. Good memories. How do you pick what tricks to throw in a particular video? As far as choosing tricks goes, sometimes there will be a theme for a video, so I’ll put in the tricks that work alongside that. For example, in Ill Vibes the theme was horizontals (simple enough). For Goldmine, we knew that we would be shooting slow motion and that tighter, more technical tricks would look better. Then, a lot of videos have just been me doing the most recent tricks that I’ve been working on since the last video. Actually, most of my videos have been done this way. For my next project, however, I’m going to try to group tricks a little bit better together according to their vibes and flows and such (there will be 3 different parts to the video). Some tricks feel more complete and look good just by themselves, whereas other tricks look better in a combo strung together with complimentary elements. At least, these are just some of the things that I think about. But, I’m really not that organized, so I should shut up, haha. Ill Vibes is one of my favorites too, along with The Yeti. Other videos that you’ve obviously appeared in are The Cabin Tutorial series. What inspired you to start making tutorials? Chris and I had talked about making tutorials for a while before it all started. We were inspired by Jensen’s Ghetto Tutorials and the fact that there weren’t any other resources out there that were teaching the more advanced, specialized, personal tricks that we like. So, it just made sense. Is the trick selection process similar for those as well? As for choosing tricks, I really just do the ones that I like from either myself, or what I’ve learned from other people. Based on what you wear in the tutorials, what’s your favorite sweater/pair of socks that you own? My favorite sweater has got to be that green/brown plaid one I got; it literally feels like wearing a blanket and has thus been the cause of much comfort throughout these cold winters. I have a thick pair of knitted socks that I got (yellow/orange/green stripes) that are hella comfy and durable. I dress for comfort exclusively if you can’t tell already. Next, what, in your opinion, makes a trick “good”? What do you look for in yoyoing that you like? Well, I usually try not to over-analyze why something is appealing to me, because beauty for the sake of beauty is not something explicable by reason or logic. There are things that come from the heart, and I submit to that (admiration is also subjective). However, I will try to articulate a bit of how I think and what I tend to admire. I will be talking about the creative and expressive side of what the toy can be, not the sport/competing side, which I respect but have less interest in. I never understood what people meant by “finding your voice” or “hitting your stride”, but I think more recently I’ve gained a better understanding of what that means. I think that it’s quite simple, organic and just takes a very long time. I think “hitting you’re stride” is when you have practiced and put so many years into a medium at hand that it becomes a natural extension of yourself, a third limb so to speak. Then, you are able to use that new medium to express yourself seamlessly, as you would with a hand or eye gesture. It’s not a place you can think yourself too or reach in a forced intellectual way, it’s just a slow, ever-evolving natural progression. Of course, this is a theory of types, that I think proves to be useful. So, what I’m trying to say is that the tricks and styles that I feel drawn to and love most of all come from the people I feel have hit their stride and turned their yoyoing into a reflection of their personality. They’ve become so comfortable with the toy that it effortlessly channels their essence and their interests and frames it in a way that connects with others. Let’s take an example: Ky Zizan. When you meet this dude and then see his yoyoing you just think, “Yeah, that makes sense.” His style is so honest and genuine to who he is that, even if he tried to, he couldn’t do it any differently. It’s organized chaos in the most harmonious way. His concepts are hooops level complex and borderline alien, and his flow is as confident and as organic as a curvy beach babe. His execution is Mr. Clean clean too- you can really tell that he’s an old school player and has put in the time to get good. Of course, this is me trying to put his style into words. Then, you get someone like Anthony Rojas who is just as dope in a completely different way. Anthony’s style is almost like watching comedy because he is such a master of the element of surprise, you can never predict where the trick is gonna go, and he always makes it better than you can try to guess. In the framework of conventional play, Anthony’s tricks are basically non-linear. Moving in unusual planes and axes is just what he does naturally. His style is also very musical and has a prominent dance-like rhythm to it (the way he incorporates his body is very rhythmic too). So, there are many different tools available to one’s disposal, and as you can see with Ky and Anthony, you can use totally different tools (or the same tools in a totally different way) to make something just as totally dope. Totally. I hope that sort of translates how I look at it. Another reason why I don’t attempt to break down what makes a trick good in completely technical terms is because there is so much more to a yoyo trick than the mathematical reduction of elements. You could learn a Yuuki Spencer trick, but you could never learn how to do it the way that he does it. That’s where flavor and personality comes into play, the real inexplicable good stuff. Part of what I admire about the old school generation (and why I think that it’s important for everyone to keep looking back and learn from these players), is that they seemed to have had a strong focus on execution and style (plus many of the tricks themselves have stood the test of time). Back then, players were brought up on responsive plastic and wooden yoyos, which are far more strict in nature and forces, which causes your movements to be more fluid, composed, and organic. If you want a Renegade to not snap back and hit you in the face, you have to do the trick right. I think that there are a lot of great new school players who’s content (tricks) are fantastic, but perhaps a little bit sloppy and interrupted in flow because they don’t have those fixed axle instincts engrained into their execution, and modern yoyos are too forgiving. I think that a lot of players (myself included), would greatly benefit from putting more time into responsive play. It would probably influence the content of the tricks themselves as well. Wow, I hardly ever talk as much in person. I totally agree. So, what are you planning for the near future? Right now, I’m finishing a set of videos for the team, but afterwards I’ll be working on my own project (which I’d like to keep as a pleasant surprise). It will take some time too. Do you think you’ll ever have a signature yoyo with CLYW? As far as the signature yoyo, Chris and I met up recently to work on the design. So, hopefully we can get the ball rolling soon. Lastly, what advice can you share for any aspiring yoyoer out there? To me, there are two different types of advice I can think of; from the soul, and from the player. From the soul; I would advise any player to have an honest answer to the question, “Why do you yoyo?” If you find that you are doing it to appease someone else, impress others, get some sort of attention, status, achievement… essentially using it as a means to an end (of which I have been guilty of), then there will be trouble. However, if you can do what it is you do with this toy (whether for you that is a hobby, an artistic expression, a form of socializing, a creative outlet, a sport, etc.) simply out of love, all shall be gravy, baby. From a player’s perspective, I can give some suggestions of technical things to try that I have adopted along the way and found to be helpful, enjoyable, or refreshing. Trying new yoyos: If you do the same movements with your hands using a light, round, small yoyo vs. a large, v shaped, heavy yoyo, the respective yoyo will go into completely different places, at different speeds, and with a different flow. Neither is better or worse, and I personally enjoy the variety it brings, and how it spices up your play style. Of course, after a long time I have found certain designs that I will gravitate more strongly towards. But nevertheless, if you have the privilege to try new throws, do it! Playing in front of a mirror: I know John Ando does this as well. It’s visually quite pleasing and I think it makes your brain look at tricks differently which helps to find new sorts of movements and concepts. Listening to music: yoyoing to music is where it’s at. It’s hella fun, get’s me energized, and it helps me believe that I have some inkling of rhythm or flow to my tricks. Plus, music can be a great source of inspiration. Good lighting: I take a lot of pleasure in how visually pleasing yoyoing can be, and if you have good lighting (I find that a strong source from directly above yourself is best) it can inspire much enjoyment indeed. String length: I believe it was Mark Montgomery or Jensen that first told me that string length should be proportionate to the size of the yoyo that you’re playing. I definitely think that’s a good rule to take loosely, but still, do some experimenting! Playing long string vs. short string is just like variety in yoyos, it forces you to do things differently. To me, it’s all about the exploration and discovering new things, and I just kind of bounce back-and-forth between the two while loosely sticking to the rule of proportions. Bearings: A bearing is responsible for basically 50% of the performance of a yoyo. If you don’t like how something plays, don’t be quick to judge the design, put a good bearing in first. I’m pretty sure that’s about all I can think of! That is all amazing advice, thanks Chuck! Good luck with everything, and keep up the great work! David Ung is kind of a genius when it comes to making up yoyo tricks and putting together great clip videos. For a while now, David’s been sharing his innovative tricks with the community and making a name for himself as an extremely creative yoyoer with a lot of talent. Sponsored by YoYoFactory, David recently released his new video, “Daydream” and is without a doubt maintaining his reputation as a force to reckoned with in regards to trick creation. His short, subtle tricks are amazing, and he is along the same lines of great, modern trick-creators like Adam Brewster and Guy Wright. I was really excited to interview David, and we talked tricks, his videos, and more! Enjoy! David, you’re one of my favorite yoyoers and are, in my opinion, a master at coming up with super creative tricks. When did you first pick up a yoyo? Thanks for the kind words, Matt! I think my story with yo-yos is pretty similar to most people’s my age. When there was the huge yo-yo boom in the late 1990s, I learned to throw a sleeper on a cheap transaxle yo-yo and that was pretty much the extent of my tricks. Then in middle school (around 2005), I saw a FAST 201 commercial on TV and thought it looked super cool. A friend of mine bought one at the store and started to learn, so I did some research online and came across JD’s Worlds 2003 freestyle. It blew my mind and I was hooked. I bought a Kickside shortly after (which I then broke–long story). I remember those commercials! So, I’m guessing you learned most of your tricks back then online? Yup! I learned most of my fundamentals from André’s old website, Mastermagic. I think I got stuck on the more advanced tricks (ie: Black Hops, Spirit Bomb, Superman, etc) so I started to watch clip videos and tried to come up with my own stuff. Aside from JD’s stuff, what were some of your other favorite tricks and influences when you first started? As a beginner, I really tried to absorb anything I could, so there is a lot of influence from pretty much all of the big names. I would probably say that Spencer Berry and Jason Lee were the biggest influences in my early style, you can see this in my older videos “Visage”, “Incidental”, and “To and Fro”. Actually, if you watch Spencer/Jason’s video “The Fidget” and watch my videos “Incidental” and “Broke,” you’ll see that my videos were actually a bit of a tribute. I think my yo-yoing is mainly focused on doing subtle moves rather than constructing whole tricks (which is why I started filming short moves on Instagram–which I think lead to #trickcircle), so I find a lot of inspiration from pretty much everyone. I love a lot of your older videos, when I started making my own tricks they definitely inspired me because they seemed like something that I would come up with. As I went on though, my tricks kind of branched out into something more unique to me. I definitely see the Jason/Spencer influence! What was your method to making up your own stuff then? Back then, I was a big proponent of learning on a responsive yo-yo to get proficient at yo-yo control. After I had a solid foundation (smooth yo-yo control + tricks like White Buddha, Skin the Gerbil, etc) I just sort of stumbled on things. I spent a LOT of time watching yo-yo videos back then, so sometimes I would see a trick and then think of my own variation and sort of keep it in the back of my mind until I had a chance to try it out. That’s definitely a good method, it worked well because a lot of your older (and newer!) tricks are really good. 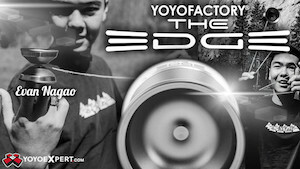 How did you end up getting sponsored by YoYoFactory? Ben used to run the “Project Red Alert” blog back in G5/GM2/888 era which was basically the YYF blog that had all of the info on new releases. He posted my video “Visage” and I was super excited about it. It was a really big deal for me at the time, so I sent him an email just saying thanks. He responded saying how he really enjoyed the video and he mentioned wanting to sponsor/support me somehow, but I wasn’t quite at the Contest Team level. After a couple of emails, he asked me if I would be interested in joining a YoYoFactory Junior Team if they started one. I said yes, and that’s how the Junior Team was started. We then had video “auditions” and ended up adding Paul Kerbel, Patrick Borgerding, John Chow, and Yuji Kelly to the team. Looking back, it was a really impressive line up. That is an impressive line-up, that’s awesome! One of my favorite videos of yours is “Broke”, which is a straight up trick video that’s over 4 minutes long. How long does it take you to compile enough tricks for a video like that? “Broke” is a good one, I was always a big fan of those pure trick videos. Four minutes of new tricks sounds impressive at first, but I think it’s important to note that it was released three years after my last video at the time, which was “Your Future’s With Us” (I’m not counting “Edit,” which was just a quick clip). What do you do to stay creative? I don’t really do anything in particular to stay creative, I have periods of highs and lows. Being invited to Steve’s 365 Yo-Yo Tricks project with Ed, Drew, Nate, and Guy (+ guests!) was a big help, though. That year was really good for me. Actually, a lot of the tricks in “Daydream” have moves that directly came from that project. That’s true, I’m not sure if I could come up with that much great stuff even in 3 years. For those that can’t tell yet, you make a lot of good clip videos. Do you have any creative inspiration behind those? You have a good variety with your videos too which I like. 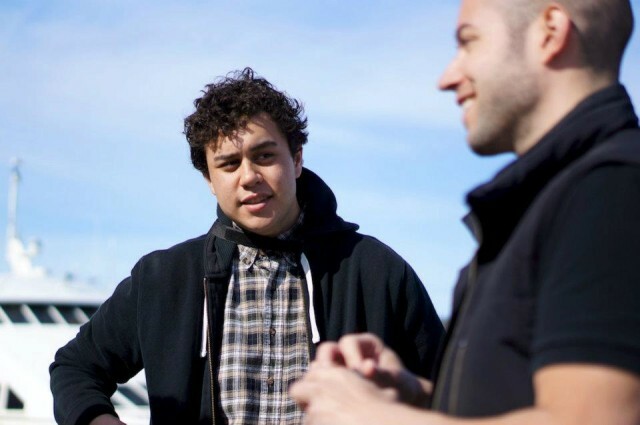 In high school I got really interested in film making after talking to Miggy and Spencer a lot. “PATH to Agartha” is a tribute to Miggy’s “Tunnels” video, while “Incidental” and “Broke” are a tribute to Spencer’s “The Fidget.” I also remember talking to Bergy about making yo-yo videos that are tributes to the music video of the song. I think he wanted to do a video to Lisztomania by Phoenix. I thought that was such a neat idea and was really into Tokyo Police Club at the time, so I tried to make “Your Future’s With Us” a tribute to the music video for “Your English Is Good.” I thought it did a great job of capturing the feeling of a bunch of friends relaxing and hanging out. “Daydream” was made as a goodbye video to LA. I was born and raised in LA and I’m moving to Seattle soon, so I wanted to celebrate my time in the city with a video that incorporated beautiful LA scenery with a nostalgic vibe. I like to think that the most important thing in a yo-yo video is the quality of the tricks, but I try very hard to incorporate a theme to give my videos an extra oomph. That’s partly because I’m not a very competitive yo-yoer, so a lot of my presence in the community is through my videos. “Your Future’s With Us” was my favorite video I’ve ever made. It was my first time shooting in HD video, I filmed it with the help of my friends, and I learned how to use some video editing software for it too. It had good vibes, music, and color. For years I wanted to make a sequel to it, but I felt a ton of pressure (mostly from myself). If I went through the work of making a sequel, I wanted it to be better. It had to stay true to theme of “Your Future’s With Us,” it had to have better tricks, and it needed to feature some of my favorite places in Los Angeles.I have tried filming for a sequel for a couple of years now, and I’ve always scrapped the footage because the shots weren’t good enough, or the tricks weren’t good enough, or I couldn’t find the right music. But in late December 2013, I learned that I was accepted to the University of Washington for a graduate school program in Chemistry and I decided that I wanted to get a video out before I moved. I decided I wanted to use the song “40 Day Dream” by Edward Sharpe and the Magnetic Zeros, and I wanted it to be a goodbye video to the city I grew up in, Los Angeles. So I gathered up some friends, and we did a ton of filming in January 2014. I had just gotten a new camera (Canon Rebel T3i) and was learning how to use it. I had 32+ gigs of footage and I ended up sitting on it for the months because school started again and I was really busy. I eventually went back to look at the footage and scrapped almost all of it–it just didn’t look good. I was still learning how to use the camera at the time, and I wasn’t satisfied with the results. I moved back to LA in June and I rounded up my friends again to do some more filming. We filmed a ton in the peak of the summer and it was HOT! Unfortunately, I wanted to keep my look consistent between the footage in January and now, so I wore my oxford shirt and long pants for continuity. Eventually we finished filming and I sat down to edit it. I went back and forth editing for about a week. The hardest part was getting the colors right, I ended up having to try a couple of different programs to get the color to look the way I wanted it to. There was a lot to do and learn, but I think it all paid off at the end. “Daydream” is a tribute to the city I grew up in, the people I’ve met, and the memories I’ve made. It sounds a little serious for a yo-yo video, but I love LA and all of my friends I’ve made, and I’m going to miss them a lot. That’s so cool, the whole experience definitely paid off. 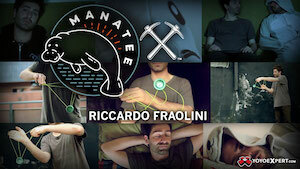 I think yoyo videos with that kind of thought put into them are the ones that turn out the best. It was so nice to see fresh tricks and a fresh, great video from you! Nice work! I personally think that impressive tricks in impressive clip videos are just as impressive as impressive contests freestyles. 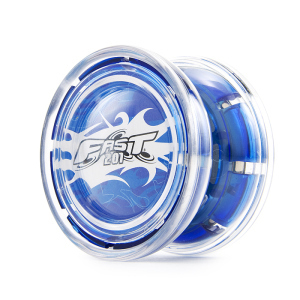 Have you ever thought of having your own signature yoyo? As much as I love competition-ready throws, I also like yoyos that have more of a laid back, steady feel to them which I could see a signature throw of your’s having. Thanks Matt. I appreciate it! It’s funny, I think I’m actually one of the guys that have been on the YYF team for the longest and doesn’t have a signature yo-yo. I don’t really mind, though, my yo-yo preferences change pretty rapidly. There are days where I’ll want something solid like a Superstar, or something plastic like a Northstar, or something lighter like a Shutter. Maybe a signature colorway or something would be nice. We’ll see! You’re welcome! My preferences change a lot too, so I know what you mean. I would really have to generalize everything I like best into one yoyo if I ever had my own signature throw. I’ve noticed in “Broke” that a ton of your tricks start with a simple trapeze and all transcend into something different. Do you have any favorite elements or mounts to work with, like the trapeze? The start/end in trapeze was actually my shoutout to “The Fidget.” Each one of Jason’s tricks ends in a trapeze in that video, and I thought it was a neat way to add a recurring theme into a video. As far as favorite elements go, I really like Magic Drops. Oh yeah, I never thought about that. You definitely have some of my favorite magic drop tricks. It’s cool how you were inspired by other yoyoers, and made the inspiration into your own thing. What kind of advantages do you think making shorter tricks has as opposed to making longer ones? I’m not sure if it has any advantages/disadvantages… it’s just an individual style thing. Some people can come up with really long, cohesive tricks (ie: Yuuki, Zach, Ando)… but I can’t. I don’t think I have the trick vocabulary to make really dense, long tricks like those guys do. On the other hand, I can still come up with neat moves and put them in short, < 15 second, tricks. I think Drew (Tetz) and I are really similar in that regard. Short tricks por vida. I don’t think longer tricks are “better,” but I do think that the players that can create long tricks have an incredibly impressive trick vocabulary and consistency. But I pride myself in making neat, subtle moves in my yo-yoing. I never thought about that comparison between you and Drew, but that’s totally right. I definitely like your mindset when it comes to making tricks. What advice would you give anyone trying to make their own stuff? Learn the trick history. There is a ton of gold that people were working on in the old-mid school era when the technology wasn’t as good. A lot of those ideas deserve a second look. Also, style is just as important as originality. If you’re having a hard time coming up with something new, work on being able to perform a trick in a specific way or with a specific look. I totally agree with all of that! There really is a goldmine of elements from back in the day, and I also think that being able to do things stylishly is important too. Lastly, what can we expect to see from you in the future? Do you have anything yoyo-related planned for when you get to Seattle? I’m not too sure! I’ll probably do more #trickcircle stuff, but I am pretty much tapped out on new content. I’d love to make a sequel to “Broke” or “Daydream.” I want to try to get Sterling back into yo-yos (maybe film a video!) and I’m hoping to compete at PNWR next year and to do well. That sounds like a great plan, good luck David! Thanks for doing this! No problem, Matt. Thanks for having me! Zach Gormley is without a doubt one of the foremost names in modern yoyoing. His innovative, genius tricks have not only gained him recognition within the yoyo community but actually outside of the yoyo community as well. Zach is a double threat in his combination of innovative and competitive tricks on stage, all the while remaining pretty humble and just being a pretty nice guy in general. If technical, well-developed tricks are what you’re looking for, Zach Gormley is definitely the yoyoer to watch. I had the opportunity to interview Zach and was super excited to learn more about one of my favorite yoyoers! Hey Zach, thanks for doing an interview! First of all, how did you start yoyoing? I got into yoyoing when I received a Yomega Brain as a party favor from my friend’s birthday party. After that I began looking up Youtube video of professional yoyoers and was hooked. I then purchased a FHZ and started to learn more advanced tricks. However that yoyo broke and I didn’t get back into yoyoing until a couple months later when I bought a Throw Monkey at a toy store in Japan. We definitely had some of the same first yoyos. So, what’s your creative process like behind your tricks and videos? My creative process behind my tricks are always changing. Someday I may look at a mount and think about where to send the yoyo next compared to other times where I will already know how I want my trick to look and I’ll work to make it happen. Lately I have been trying to make tricks that feel natural and make sense composition wise. Inspiration from other players certainly helps too. I think we naturally yoyo more and more like the players we always watch. When it comes to videos I try to portray my tricks in a way that are easy to see and also work to make the video in a way that will create interest in the hobby itself. That method honestly works, I know some of your videos have been watched by a lot of people that don’t yoyo. In your opinion, how do you make up a “good” trick? I personally think that the two biggest factors for making up good tricks is originality and trick composition. By trick composition I mean the way you order each element in your combo. In this current generation of yoyoers I think trick composition will be huge for standing yoyoers apart from the rest. So many players right now have good ideas but when those ideas are put together in an order that makes sense and flows it becomes all the more impressive. Takeshi Matsuura, Tatsuya Fujisaka, Sebastian Brock, and Charles Haycock are all great examples of players with good trick composition. I totally agree. How do you prepare for all of the contests that you always seem to do really well in? For me the hardest part of making a good freestyle is just finding the right song haha. Once I do that I can just start putting my tricks in places that fit the music until I have a complete routine. I try to have this done around a month before so I can practice during that extra time but it doesn’t always end up being that ideal..haha. Nice! As a super creative yoyoer, who are some of your favorite yoyoers? When it comes to 1A I have many yoyoers that I like, but my absolute favorites are Yuuki Spencer, Takeshi Matsuura, Charles Haycock, Tatsuya Fujisaka, Takahiro Iizuka, Anthony Rojas, and Shinnosuke Miyamoto. All of these players have an outstanding mix of tech and creativity in their yoyoing. They manage to tie those two components together into clean, aesthetically appealing tricks. I could watch them for hours! I also really enjoy watching Shu Takada, Shinji Saito, Rei Iwakura, Ben Conde, and Hank Freeman. You definitely have good taste in yoyoers! You’re sponsored by CLYW, how did that come about? I got sponsored by CLYW in May of 2009. This happened because Chris liked some of the recent videos I was putting out. I was always showing off my tricks and ideas through videos and in a sense promoting myself. He contacted me prior to BAC and told me he wanted to ask in person there if I’d be willing to join CLYW. You can probably guess what my response was. I would assume that you said yes! You are also one half of Innovation Movement, which is kind of exactly what the name implies in regards to yoyo tricks. What’s the story behind Innovation Movement? Innovation Movement was a project that Isaac Sams and I decided to start up to try and get players thinking outside the box. We wanted to feature a wide variety of players and have many players from all over the world including Russia, Japan, Hungary, and more on our channel! If you would like to see you can visit our page at InnMovement.com. I have to say, I’m a big fan! Next, what are some of your favorite qualities in a yoyo? I wouldn’t say that I am too picky when it comes to yoyos. Lighter, more nimble playing yoyos can be more fun but a very solid yoyo you can rely on can be nice as well for that reason. You don’t have to try as hard to keep the yoyo centered or spinning fast. Of course you’ll always want to be trying to do so when in competition. Absolutely! Speaking of which, what’s your favorite contest to compete in? This is a no brainer. My favorite contest to compete at would have to be Worlds. Nothing can beat the roaring crowds and level of competition at that contest! For sure! Last, but not least, what can we expect to see from you in the future? In the future you will definitely see me at more competitions. I plan on going to US Nationals and 44 Clash next. I’ll also always be working towards that Worlds title. When it comes to videos I plan on posting more tricks to Instagram. A full fledged video for YouTube will hopefully come in due time haha. They require a lot of time and can be hard to make without another yoyoer who knows how to use a camera. I’d personally really like to see you get a Worlds title. Good luck, and thanks for doing this Zach! You can next see Zach compete at the 2014 US National YoYo Contest in Chico, California and at 44Clash in Kanagawa, Japan. His signature model yoyo, the Arctic Circle: 2nd Expedition, has another release scheduled for Thursday, September 11th at 10 pm EST. When it comes to modern yoyoing that is equally creative and competitive, Anthony Rojas’ tricks are basically everything that you could possibly want and more. Anthony has proven himself countless times in winning several contests, and will undoubtedly remain a relevant name in yoyoing through his creative style and memorable freestyles. I decided to catch up with Anthony on his recent contests, creative process, and more! Anthony, you’re one of the most creative and talented players I know of that’s around today, how did you start yoyoing? I had a yoyo or two as a kid in the 90s, but it was only a toy to me then. I got into Astrojax some years later, and through that I started discovering modern yoyoing. I consider August 2005 the beginning of my serious yoyo “career” when I got yoyos like the YoyoJam Dark Magic and Free Agent. I also started going to the Sunshine Kite Company in Redondo Beach, CA because of their yoyo classes/ hangouts. Lots of great players learned at that shop. It’s actually really crazy thinking how I’m in Europe right now because of yoyoing, along with other players that also came from the kite shop. That is crazy, who were some of the other players that frequented the shop? Yoshi Mikamoto from YYJ taught at the shop. There was also Grant Johnson, Patrick Borgerding, Alex Hattori, Alex Kim (RecRev), Dylan Benharris, and others too. What was your approach to learning tricks early on? Learning tricks early on, I didn’t necessarily have an approach. I just learned what I could from people in person, or watched tutorials and videos. I never dwelled on tutorial watching too long though, I liked making up my own tricks and learned things along the way. I think it’s good to have a solid foundation as a beginner, but I never had a plan or a goal at that time. I just did what felt right. I also agree with that being a good approach. Being known best for your really creative tricks, when would you say that you started to become good enough at making tricks to be recognized within the community? I definitely started to get more attention outside my area when I won South West Regionals in 2009. Not long after, I got 5th at Worlds. Looking back my style has changed a little over time, but I’ve always tried to be both a creative and competitive player. Right now it’s a little difficult, I wish I had more time to focus on both realms. After this year’s worlds I almost feel a little behind. So many good players right now! I totally agree! I’ve only been yoyoing for a few years but I’m even amazed at the amount of talent that’s came out since I’ve started. So, you just kind of decided to start competing eventually? I started competing pretty quickly. January of 06 was I went to my first contest and did sports ladder and 4a in X division. I don’t think I thought about it much at first, but I believe it’s good for beginners who are serious about competing to get some stage time. Even if you think you won’t do well, just worry about doing the best you can and gain experience. Learn the system, learn how you can improve. Even now, if I execute my freestyle flawlessly and still lose, I can’t complain much. I did the best I could and will learn from that experience. 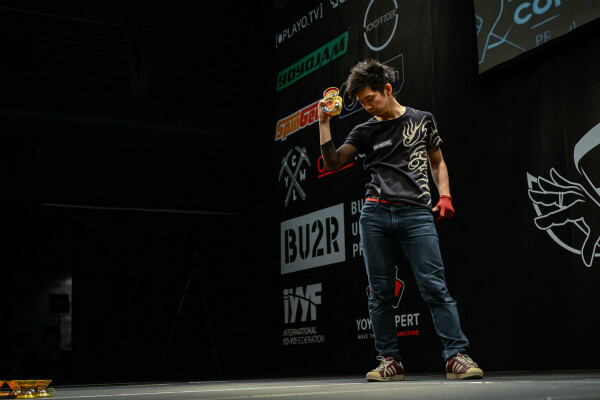 Did you have any aprehension at first about combining creative and competitive yoyoing on stage? I never had any apprehension when it came to doing certain creative moves in the past, but recently it’s more difficult. You have to find the right balance of creativity while still keeping in mind points and the judging system, at least when you’re trying to win. In the future, I’d like to show less point driven freestyles that are just nice looking creative routines, whether it be filmed or on stage. Definitely, your tricks are so good that I think they look good just about anywhere. What’s your process like in making up tricks? My process isn’t really set in stone, but it’s usually a lot of experimenting and trial and error. It depends on the trick, but I’ll usually just have an idea or mount, and keep exploring possibilities until I like the outcome. Sometimes you have to scrap ideas that simply don’t work, or keep working on them for months before something comes out of it. There’s not really a secret formula for good tricks or concepts I guess, just don’t limit your exploration. Yeah, I feel that like that’s definitely true. I just started getting serious with making tricks a little while ago, and it really did take me about a month to figure out where to go from the first few moves of a trick I made up. What are some of your favorite elements or mounts to use? I know you like a lot of arm/body tricks. Some of my favorite tricks are made of simplified elements in general. Or things that have a nice movement to them. I do like arm and body stuff, but that’s really just me trying to be different when I can. It’s funny because I think maybe there’s kids watching freestyles who haven’t met a lot of other yoyoers, and probably think those are the kind of tricks I always do in my free time. Or that such and such person always yoyos super fast or something. I think some yoyoer’s styles are the same on and off stage, but it’s not like I normally do weird, kneeling, horizontal, body tunnels when I’m just chilling haha. I think the same goes for a lot of others. You recently took 5th Place at the 1st ever Duncan IYYC, which is definitely impressive. Did you plan on placing so high? I was surprised I got 5th actually. I wasn’t sure how landing my freestyle perfectly would place, because it was slower paced and wasn’t as tightly based on points. I just wanted to do a cool freestyle. Unfortunately I messed up with two restarts. So getting 5th is kind of alright in a way. I was more bummed out about not making Worlds finals, although the contest itself was probably one of my favorites I’ve been to ever. IYYC was nice and I hope they can keep it going, but Worlds was a really amazing experience. They both seemed amazing! At both events, who had your favorite freestyle in 1A? Maybe Zach’s Worlds freestyle. I’ve seen some of his tricks over and over, but they just don’t get old. Takeshi’s freestyle was also nice, and Sebby’s music choice and execution at IYYC had this really nice feeling to it. I love Zach’s tricks, his Worlds freestyle was one of my favorites too. What other contests are you planning on entering in the near future? I plan to go to South West Regionals, maybe the DXL Battle, Nationals, and the Las Vegas Open. I’m actually really looking forward to all of them for different reasons. They should all be nice contests. I especially want to see how the Vegas one turns out, and want to see some of the things going on with SkillCon too. I’m not going to be able to make 44 Clash this year, but I hope I can make it to Japan for Worlds next year. The Las Vegas Open does sound like an awesome contest, nice! Do you have any other non contest related yoyo endevours planned? I’d like to say the clip video Grant and I have been planning will come soon, but I can’t be sure. We’ve continued to push back filming because our schedules never meet up right. At this point it will happen when it happens, I’m just sitting on tricks and making up new ones until we can do it right. No need to rush and have a bad video. I’m working on a logo for a small company right now too, so that, and hopefully other design related work in the yoyo world will happen. Awesome! Lastly, what advice could you give to someone just starting to yoyo and looking to compete and innovate in the future? People starting out and thinking about innovation and competition could mean a lot of different things, depending on who you are and what you want out of it. Assuming it’s someone that wants to win contests or be known for innovation or something like that, I think for both categories you should try to understand what makes others successful. Study others not only for what they do, but why it worked for them. Competition has a lot to do with the system, the rules, so learn that first. Try to understand the specifics over time, and gain experience by entering contests even if you think you won’t do well. Try to worry about improving yourself and not worrying about how you place. Remember that not everyone has a competitive style. It also helps if you not only know the rules, but eventually learn how to judge yourself. We’re less than a month away from the 2014 World YoYo Contest, and everyone is finalizing their travel plans and getting excited for the event. The event organizers took a moment to speak with judge Matthew Fernandez (aka Boxthor), who is flying in from San Francisco to judge several divisions. Hello Box! How are you today? We are all pretty excited that you’re heading to Prague for WYYC. Why did you decide to go? I’ve gone to the World Yoyo Contest for the past 9 years in a row, and now it’s tradition for me – I don’t go for the contest, I go to hang out with friends from all over the world, many of whom I only get to see once a year. I’ve always wanted to visit Prague and now I have the perfect excuse to. What do you expect from this event? I’ve watched previous EYYC streams, and from the looks of it, Prague is able to put on a professional looking event LEAGUES ahead of any other contest I’ve been to. I think it’s exactly the direction the yoyo industry needs to go in. What are your suggestions for making WYYC better than it ever was? Is there something crucial we should not forget? Paid flights for top competitors and judges would be a great start. I think as a contest, Worlds was always fine, but it was severely lacking in media exposure and recently, didn’t do anything to really promote the industry. Do you know that the local community sees you as quite a star? Why do you think that is? 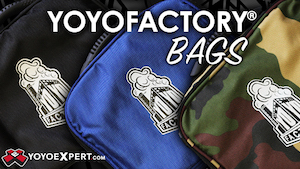 Back in around 2007, YoYoFactory started coming out with their first widespread models, and really got players excited about making videos. Vashek rose to fame quickly, and I soon became friends with him and his brother Ondrej, who did all the filming. I don’t know much about the Czech scene, but I imagine Vashek / YYF was a great starting point, as as that community grew, they began to go and search for other yoyo videos, and I was putting out both clip videos and the freestyle videos for a lot of the major contests in the US at the time. Do you plan to do some special project while you’re here? I’ll have my camera – I’m not sure what I want to do with it yet. I started a new job 2 years ago and haven’t had the time to come out with a really awesome worlds video lately, but I have plans for the footage once I get some time. Are you going to participate in the event as a spectator or are you planning to get more involved? One of the main reasons I love judging is that I get a front row seat to see all of the freestyles – besides that I’m looking to just hang out with friends and take in the sights. Is there anything special you’re planning to do or see in Prague? I haven’t started looking in to extra activities but I did book a couple extra days to go sightseeing, so I am open to suggestions as to what to check out. I want to get a tattoo while I’m there but I haven’t decided on a design. What’s the most Czech thing I can get? I need help deciding, or else I’m gonna end up with a tattoo that reads “Strč prst skrz krk”.